Rev. Amy Fallon came to Trinity in 2017 with several years of experience in campus ministry and in parish ministry. 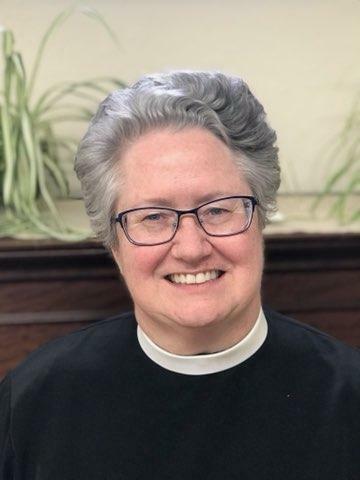 Most recently she served as a campus pastor for Grace Place, a combined Episcopal and ELCA Lutheran ministry at Northern Illinois University in DeKalb. Born and raised in the Northeast, she has adopted the Midwest as her second home. Her enthusiasm shows in her attraction to down-home cooking and local artists. She holds her Master of Divinity Degree from Weston School of Theology in Cambridge (MA) and describes herself as a “born teacher.” She enjoys working with adults seeking spiritual formation, relishes preaching, and loves working with college students. She especially values her Outstanding First Year Experience Teaching Award from the University of Connecticut (2004) and an additional nomination for the same award in 2009. Amy enjoys a wide variety of activities in her spare time, including knitting, biking, reading, kayaking, and keeping up with her two cats, Sally and Sprinkles.